Libyan strongman Muamarr Qadaffi has reportedly armed militias surrounding Tripoli in preparation for an expected rebel push on the capital. 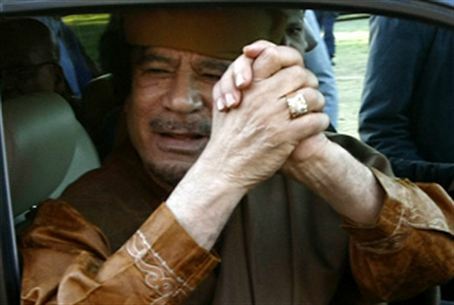 Libyan strongman Muammar Qadaffi is bracing for an assault by rebel fighters who have broken out in the Nusafa mountain region some 50 miles from Tripoli, Sky News reports. The rebels, who have seized several mountain hamlets in small, but decisive battles are now planning to make an assault on the loyalist stronghold of Gharyan, which strategic analysts say is a key obstacle in reaching Qadaffi's capital. Women's militia groups are being trained to use weapons and the whole area is being flooded with government-supplied guns. The women practised gun drills in front of foreign media bussed in from Tripoli. The women told reporters they had volunteered to form the militia to defend their homes and their children. "We will die for our country," a gun-totting woman hidden by dark glasses and a traditional scarf said. "We are not scared of the rebels. We will fight if we have to but we will also negotiate a solution to all this - but our leader [Qadaffi] must stay," she added. Some observers say Qadaffi's use of female militia fighters may be a cynical ploy to put the rebels, who have enjoyed strong western support, in a bad public relations position. Qadaffi loyalists have organized few officials trips for reporters, who are shadowed by government minders, into areas between his stronghold and rebel lines and the move's propaganda potential cannot be understated. Reporters on the trip said men lined the road firing thousands of rounds into the sky to greet them, and that on rooftops women and children waved and shouted pro-Qadaffi slogans as they passed by. Qadaffi's government has reportedly been stocking up local people with a huge array of weapons and roads have been filled with trucks packed with men in military garb, but analysts are uncertain how many of the men are actually soldiers. Rebels have seized the city of Kikla, southwest of Tripoli, and say they are preparing to strike. Despite their confidence, observers question how the rebels can advance further along the mountain range from their current position further west without major assistance from NATO. Even then it is uncertain the personality cult Qadaffi has cultivated over the years will simply fade away, which the rebels predict, or stand and fight. What is certain right now is that Qadaffi has armed huge numbers of civilians in strategic towns overlooking Tripoli and plans to remain firmly ensconced.